Gionee announced its latest ultra smartphone Elife S7 at this year's Mobile World Congress. Developed under the 'making slim to perfection' product development philosophy, the device focuses on performance and user experience more than just ultra slim design. Inspired by the U-shape design of railway tracks, this device features iconic frame design, beautifully merging a high glossy finish and metal effect with two parallel metal light lines. The unique ergonomic side profile provides an extremely comfortable grip for one-handed use. The metal used on this smartphone is aviation level aluminium magnesium alloy, making the skeleton solid and durable with no worry of bending in pockets like competitors' slim products. Despite the durable metal, both the back and front have Corning Gorilla Glass 3 protection against scratches - ultimately creating a combination of hardness and softness to bring maximum protection to the device. High power consumption has always been a big problem for ultra slim phones. To enable the battery to last for a whole day, this device is equipped with a 595 density 2,700 mAh battery. In addition, Gionee has optimized both the hardware and software performance to lower battery consumption, bringing energy efficiency to users' fingertips. With industry leading Synchronous heartbeat technology and the intelligent control background, the background can reduce the number of times the system wakes up by tracking energy use over time and killing unauthorized apps. In terms of the user interface, according to the illumination feature of AMOLED screen, the user interface has been optimized. The smartphone features a unique extreme mode, which automatically enables 10% of remaining battery power to potentially last for 33 hours 45 minutes standby time by freezing functions except calling and text messages to ensure basic communications. With the MTK 6752 octa-core 64-bit 1.7 GHz processor, the HPM technology enables the processors to run at a high speed and remain at an ultra-low power consumption level. A flat 13 MP camera embedded in the device looks more natural. Gionee's own 'Image+' image processing system enables users to shoot stunningly high quality images with easier user experience. Powered by the night mode engine of Image+, the device can capture 6 pictures in a second, and compose them to a single picture by adjusting the brightness and image noise. As one of the fastest cameras with zero delay in the market, the device can capture a picture with only 500 milliseconds, and its focus time is only 300 milliseconds. The 8 MP front camera incorporates intelligent Face beauty 3.0 technology - the device can estimate peoples' gender and age, and recommend the best over the face beauty effects for more natural selfie photos. The smartphone will include a Hi-Fi level headphone and offer superior sound quality with instinctive Hi-Fi standard sound system that features sound restorations. With the built-in tailor-made speaker and Smart PA, users can enjoy music accompanied by louder and richer sounds, bringing a home theater system experience to an ultra slim phone. It is the first ultra-slim phone that supports dual SIM, multi-band and multi-mode such as 4G FDD/TDD LTE and 3G WCDMA/TDSCDMA. At the launch, Gionee also unveiled the 3rd generation of Android 5.0 Lollipop based Amigo OS; this smartphone will be the first product running Amigo 3.0, which is more faster. 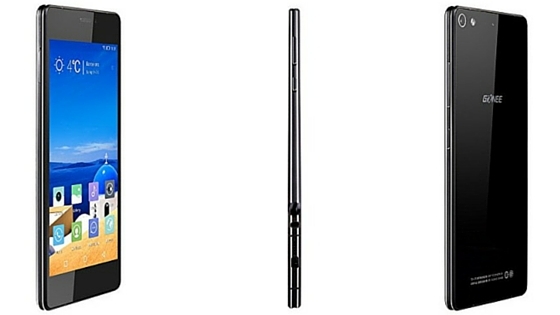 The smartphone stands at 5.5 mm thin and will come in Black, White, and Blue.